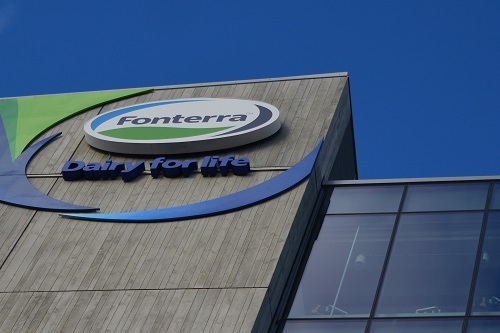 Giant dairy co-operative Fonterra has announced a 65% lift in net annual profits to $834 million. The latest result well surpasses last year's although the confirmed final payout for the year just gone (milk price of $3.90 and dividend of 40c, for a total of $4.30) is actually below last year's $4.65. A fair bit of the interest was taken out of today's result announcement by yesterday's surprising upgrade from Fonterra of the forecast milk price for this season, to $5.25. Chairman John Wilson said over the past three years Fonterra had worked hard to align its structure to its strategy with a focus on achieving more value for the volumes of milk produced by its farmers. 'The higher forecast earnings per share range [for the coming year] reflects the performance improvements the business will continue making. 'It is still early in the season, and we expect continuing volatility as reflected in price improvements in recent GDT auctions. 'Current global milk prices remain at unrealistically low levels, but as the signs in the market improve, we are very strongly positioned to build on a good result in the year to come,' Wilson said. And today an acquaintance was telling me her husband does 13 hour days, this week day shifts, last week night shifts, next week night shifts again, driving Fonterra tankers, from Hamilton to Whangarei. His body clock will be getting a right royal work over. She freely acknowledged he is driving a weapon and just hopes he is not getting pushed past his limits. They fortunately live in the country where he is able to sleep, undisturbed, through the day when he is on night shifts. He is no spring chicken. Steer clear of milk tankers, I suggest. There is no accounting to the lengths that some people will go to sustain their own agenda. Dirty, filthy pollution and over charging for what some see as hard cheddar, but essential to the big scheme of things. But is not certainly true.. When actually, pure water is more essential than those milking the system, for unjust reward. My children have both gone dairy free. And are better for it. I think this may be the way of the future, but some people think the "Milk of Human Kindness", is to overload their offspring with over priced Dairy products. Now I love cheese, in small doses and can drink coffee, black or white, but when push comes to shove, the planet and environment should come first, surely. So I think a concerted effort to reduce pollution is needed. Starting at the top with Fonterror..Then working our way down to zero emissions. When cattle crapping etc, is down to a minimum, then maybe we can all do away with burning forests to provide the fodder needed to sustain the downward spiral in human health and reduce the fat of the land to make a quick buck, out of human misery, going forwards. Mcdonalds next...plus all those other fat peoples multiple dementia suppliers. But what the heck...let us all go vegan and maybe solve all those other health and wealth issues in one fell...swoop. My son is vegan...I am slowly coming around, but the health of the country comes first, then the health of the individual, may probably follow. The sooner the better. It's farming practises not farming that is the problem. When these farms were non irrigated sheep beef or cropping farms there wasn't a problem. But when you farm dairy cows and irrigate in very dry years the irrigated water runs off farms into very low rivers with no flow. In the past nutrients would stay on farm ( being used to grow grass) and would only run off at times of high rain fall when rivers would also be running high taking the run off out to sea.